Simply hook up any USB storage device such as a flash drive, external hard drive, CD-ROM, or even an iPod and youre good to go. Just plug in and play. The Cortex HDC-1000 give DJs more power to cue, play, manipulate, and even scratch digital files than ever before. Use the intelligent music database management system to find any track lighting fast by artist, title, genre, even by words or phrases, play them with ultra-precise pitch resolution. These beautifully crafted controllers are compact, light and portable. The HDC-1000 uses a database management system that allows the user to search through a massive library of music within seconds, by artist, title, genre, album or even by string. Databases can be created via the HDC unit or the PC application, allowing users to create and manage database files at a gig, or on a home computer with lightning fast speed. The cataloging system gives you several browsing options, including Search by Artist, Song, Title, Album, and Genre. This system allows users to search the same way they would using an iPod or similar portable music player. Users can search by a certain word or phrase to find tracks on their storage device, even if they're unsure of the name. When the user inputs a keyword, it will search all Artists, Titles, Albums, and Genres, and show all matches to that keyword. For instance, searching for the word 'LOVE' might bring up (3) artists. It might also find (60) titles, (10) albums and (1) genre. The user can then select the artists, titles, albums, or genres from that list. No need to abandon the CD collection, the HDC-1000 is able to play audio CDs with any compatible USB CD-ROM or DVD-ROM drive. Play back user-created CD-Rs or DVD-Rs loaded with MP3 or WAV music files using a compatible USB CD-ROM or DVD-ROM drive. The brightly illuminated LCD main playback screen displays info on any track in the catalog, showing everything from the essentials such as artist, track title, pitch, time elapsed/remaining to detailed information including file format (MP3 or WAV), genre, and track length. Allows users to browse through files and directories as if they were using a computer, showing them the directory structure and file names exactly as they exist on the storage device. 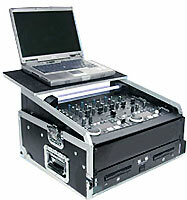 DJs with their own organizational system can navigate it quicker than using the database. The HDC's internal software can be upgraded simply by downloading new software from the Cortex website. Take a client's request from his iPod or USB memory flash drive, plug it in, and play it right away without having to reboot the unit. 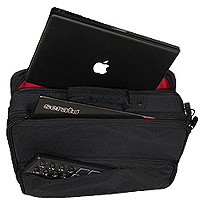 With two USB ports (and support for up to 4 devices when using a USB hub), the HDC unit allows users to connect and recognize multiple storage devices to access a variety of separate music databases simultaneously. Cue points can be set like a normal CD player, so that the DJ can return to a certain time in the track just by pressing a button. Cue points may also be saved permanently to the connected storage device, allowing them to load with a track automatically. Every Cortex HDC unit features exclusive protection from accidental shutdown while playing, securing your precious digital files from sudden corruption and preserving your performance. To turn the unit off, simply press and hold the power button for more than 2 seconds.